It’s easy to have the ingredients handy in your pantry for any time you need to impress a set of nephew and nieces or just need a quick dinner on the table. I love the unique tangy, creaminess of this dish! noodles to serve it with! Instant pot – Don’t have one yet? shop for one here! 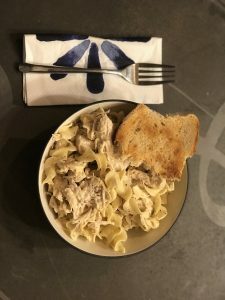 Follow these simple steps and you’ll have this Instant Pot Creamy Italian Chicken and noodles ready in 30 minutes! place frozen chicken breast and Italian dressing into Instant Pot insert. close lid and make sure valve is set to seal. Set instant pot to pressure cook on high for 20 minutes. allow chicken to Naturally release pressure for 5-10 minutes. then drain most of liquid. Select the Saute feature on your instant pot (turn it to normal so it’s not to hot, by pressing saute again), break up chicken a little bit, so it’s not huge chunks, then toss with remainder of ingredients except noodles. saute until heated through, stirring frequently. turn Instant pot to saute feature (turn it to medium so it's not to hot), break up chicken a little bit, so it's not huge chunks, then toss with remainder of ingredients except noodles. This entry was posted in Cooking Adventures, Instant Pot everything! and tagged chicken, dinner. Bookmark the permalink.